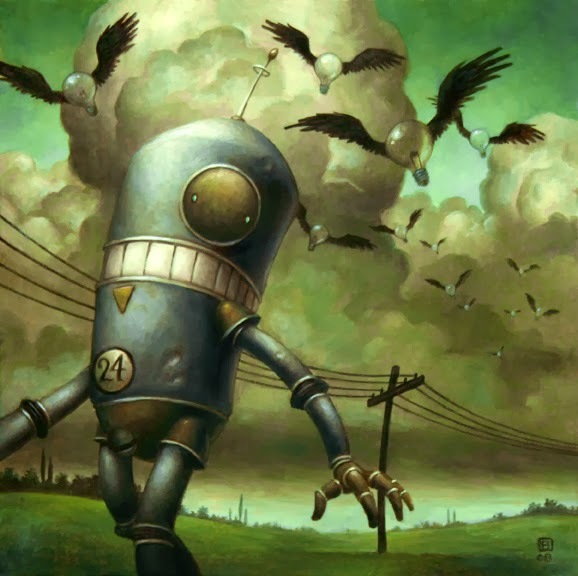 Growing up with a deep fascination for sci-fi, robots, and otherworldly oddities creates an attraction to the artist Brian Despain that, for me, is a direct connection to my childhood loves. When I see his work and it not only reminds me of my youth, sitting in my room listening Stars Wars on vinyl on my toy record player, but it also plays into current ideas of activism as an adult. The first time I was introduced to Despain, was the Baby Tattooville Exhibition at the Riverside Art Museum. I immediately fell in love with Brian’s connection to portraying this surreal contextualization of a world that has been ravaged by humans and in which the machines and nature both join forces. The style is also reminiscent of the Romantic era, showing us visions of trepidation along with a narrative that is suggestive towards where progress has led us. This imagery is comparative to a scene in a Vonnegut story. The illusion of a future that has not happened, completely fictional, but yet there is truth in it. The fish are dying, the birds are not singing, the robots have developed an emotional connection to nature and much like in Vonnegut’s „EPICAC“, the machines have another plan—one that diverts from their intended use. The irony being, humans, who not only created the mess, but created the robots as well, are the ones being taught the lesson. And together, the animal’s, lead by the robots, are rebelling against our way of life. Nice insight. Because of what you wrote I like these paintings too.